Is There A Difference Between Web Development & Web Design? | Orange County SEO Company, Inc. The terms “web design” and “web development” are confusing, even to people who are conversant in the terminology of the web. Many people assume that the two are the same, but this is not the case. In fact, it is crucial that web designers and web developers clearly identify their roles in serving their customer base in order to give those customers the best possible websites in every respect. Web design refers to what the user actually sees and how well it engages that user to interact with the website. Web development refers to the functionality of the site—how easy it is for users to navigate and find information they need, as well as how the site is structured for maximum efficiency. Content is the primary component of a website and one that ensures that users will be drawn to the site. Content shows users what you do, how you do it, and what you offer in terms of products and services. Therefore, web designers focus on what the users see when they land on your web page. Are your graphics colorful and engaging? Do you have information easily available and does that information answer obvious questions users have about your products or services? Web development, on the other hand, is a behind-the scenes issue that deals with what type of experience your users will have with using your web site. Can users navigate easily? Do links work? Do your graphics load quickly? Are the parameters of your web site set up to give your users the easiest and best possible browsing experience? The web development of the website is different from webs design this way. The technical aspect of the website is given by the web development while the aesthetic part of the website is offered by the web design. This is the main difference between these two concepts. 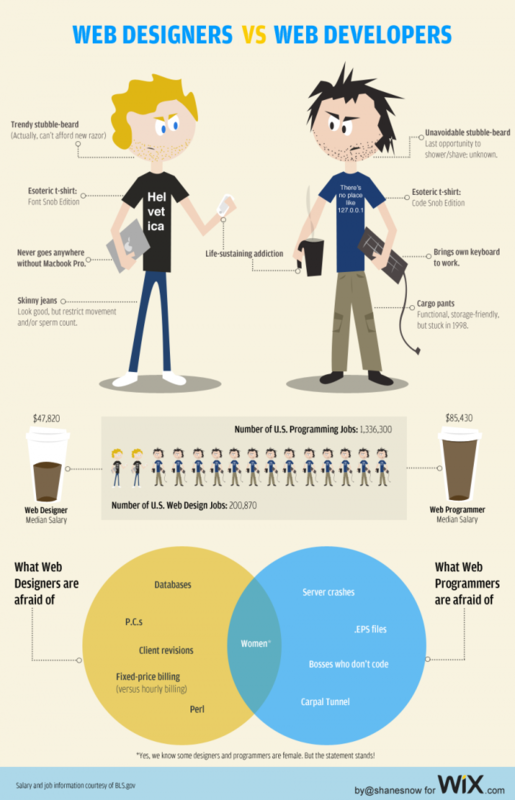 Sometimes one individual will take on the role of web designer and web developer, but this is not always the case. When a web designer specializes in content marketing, he or she often turns to a web developer for help with the technical issues that arise. While it is not impossible for one person to do both jobs, it is important that the individual keep the aspects of each job clearly defined so that he or she can work in both areas with equal facility.